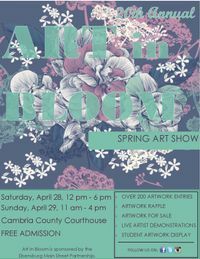 We invite you to join us for Ebensburg's 20th Annual Art in Bloom Spring Art Show at the Cambria County Courthouse. Artwork entries are being accepted now through April 2nd. Open to both professional and amateur artists. $10 per entry; two entries per artist. Monetary awards are given in five categories; drawing, dimensional, photography, painting and mixed media. 1st, 2nd and Honorable Mention are awarded, along with Best in Show, People's Choice and three Mayor's awards. Artist demonstrations will be offered. Artwork raffle will be held. Many artwork entries will be for sale.